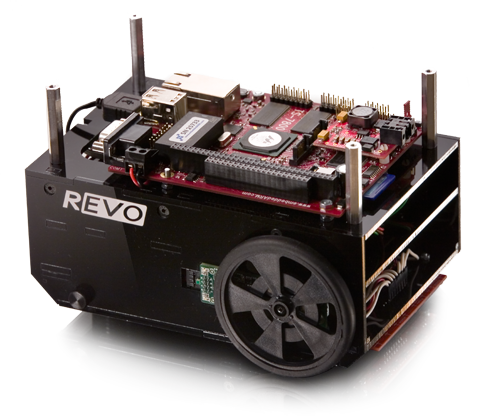 CORVALLIS, Oregon—2009 March 20th—Revolution Robotics announces the REVO 1 desktop robotics platform. Designed and developed to address the issues of modern robotics research, the REVO 1 combines a compact robotics platform with serious on-board processing to open new doors for robotics software development. The goal of this platform is make way for software developers to enter the world of robotics without the traditional burdens of robotic platforms. The REVO 1 addresses the challenges of robotics research by removing many of the limitations of traditional robotics. As an industry, robotics has been associated with mechanical engineering and many robotic systems reflect this with their radio-control based designs. Yet robotics is about much more! It is about intelligent software and making smart decisions, a task that is more appropriately associated with computer science and software. The future of intelligent robotics is in the software, yet many of todays platforms lack the processing power needed to support high level software research. REVO 1 solves this issue by combining its mechanical/mobile base with a fully capable embedded Linux computer. REVO 1 has tremendous processing power and memory to handle the challenges of robotics development and the added computing power opens the door for innovative new software solutions. Robotics incorporates both mechanical and electrical design. With sensors and peripherals requiring special mounting as well as complex wiring, software developers have had limited exposure and experience working with robotics. The REVO 1 bridges the hardware gap for software developers by building its interfaces on industry-standard connectors like USB and Ethernet. Gone are the antiquated I/O pins and cluttered hook-ups; REVO 1 makes it easier for software developers to manage the hardware platform by utilizing plug & play capabilities already familiar to them. REVO 1 capabilities are easily extended through additional sensors and peripherals all of which simply “plug-in”. The focus of REVO 1 is to empower software developers to work on next-generation robotics software by providing a solution that is ready-to-roam. The REVO 1 is easy to program though its various interfaces and lends itself well towards pure software based robotics research. Hot topics like computer vision, motion-control, and robot localization can be researched easier using the REVO 1. Built-in support for Wi-Fi means the REVO 1 is also ready for multi-agent and distributed robotics. REVO 1 comes ready-to-roam for $1599 and is available today. The platform will open new doors for robotics research and will enable developers to finally focus on software challenges without the traditional limitations. For more information or to find out more about REVO 1 visit www.revolution-robotics.com/revo1.